We would like to announce that a new webpage design has been developed. 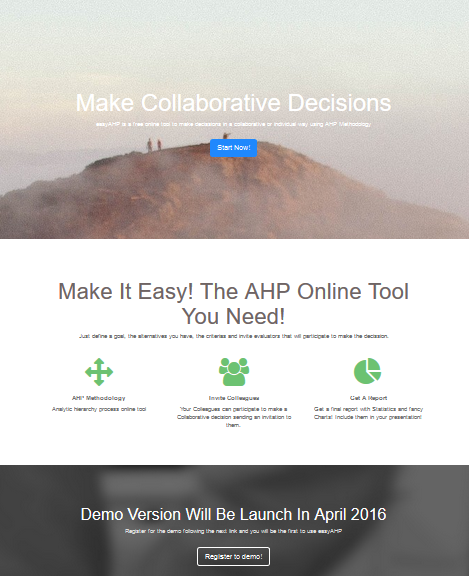 After now here you will find the last news about easyAHP: an online tool for group decision-making using the AHP method! AHP: analytic hierarchy process, is a methodology for making, organizing and analyzing complex decisions, based on mathematics and psychology. It was developed by Thomas L. Saaty in the 1970s. In the tool, just define a goal, the alternatives you have and the criterias. Then invite evaluators by email to participate in yout decisions. 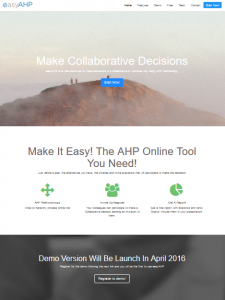 These evaluators will access to its personal control panel to fill the AHP survey. Finally you will have all the participators surveys in your administrator area in order to generate your custom report and charts! easyAHP will guide you to find the alternative that best suits the goal!